The stellar, nearly flawless strokes of his bow dancing upon tensioned strings—they resurrect meticulously crafted melodies conjured centuries ago among master musicians. Centuries have passed since then. And yet I lie on my bed at night listening to these classics, revived at the hands of a modern prodigy—every note coming to me through tiny, white headphones, as if passing through time and space. Oh, how things have changed from the days when my parents would take us on Sunday evenings to the homes of missionary or pastor friends. These nights would often end with everyone singing together, even though some of us with more dubious musical giftings could make the whole affair excruciating. Yo-Yo Ma it was not. But it was something, and something special. Perhaps the less-than-subtle changes between those days and now bear witness to how we digest music differently—a change that’s made its way into our churches. Just as home entertainment has morphed from family and neighborhood sing-alongs to the ability to consume whatever music the global professionals offer, the church has shifted away from an emphasis on corporate singing. At best, larger churches have shifted to more professional, performance-oriented music. And smaller churches have adopted less of the traditional “come one, come all” since because it feels outdated, irrelevant, and at times downright embarrassing. Who can compete with the masters, after all? It seems our society’s progress has played a role in the end of congregational singing. Right? Congregational singing is far from dead, mainly because it’s connected to a source of life higher than cultural trends or modern comparisons. Even so, it receives less attention and adulation than it should—and there are several reasons. First, people tend to be attracted to larger churches where the “performance” of music approximates the professional; in principle, there’s nothing wrong with that. Second, the music in most churches tends to be so loud that the congregation simply cannot hear itself sing. Third, smaller churches with less ability to produce professional-sounding music tend to minimize singing altogether, so as to minimize embarrassment or perceived weakness. Congregational singing is far from dead, mainly because it’s connected to a source of life higher than cultural trends or modern comparisons. But now is the moment to re-embrace the crucial role of congregational singing in our churches. Singing is an act of obedience; we gather and sing because we’re called to. Like telling the truth. Like loving our wives and our children. Like loving our neighbor as ourselves. These may seem like bold statements, but consider this: Singing is a real and tangible expression of loving the Lord with our whole hearts and our whole selves, and loving our neighbor as ourselves. Singing is also a privilege, a foretaste of heaven. After all, one day in the future every tribe, language, nation, and people will sing as one congregation before the throne of the risen Lamb. Until then, we find a microcosm of that day in the unimpressive form of congregational worship. As we anticipate the matchless glories of heaven, there’s immeasurable value in our singing together on earth. The extent of this importance becomes increasingly realized in three ways. 1. Congregational singing affects us as individuals. First, singing affects us as individuals. In our society depression abounds, self-worth is confused, marriages and families are shattering, suicide rates are soaring, and a sense of global turmoil endures. Amid all this, it’s only when we worship that we put God in his rightful spot, engaging him with our intellect, emotions, and bodies. We cannot rise above the world’s difficulties until we turn our eyes to the one higher than ourselves. We proclaim in congregational worship what sometimes seems impossible to proclaim in our natural selves: “You are the center of the universe. I am but a moment; you are eternal.” In worship, what’s personal engages with what’s eternal. And so as we sing, we lift our eyes to what’s higher, and we find relief. Ultimately, our minds are renewed as we remind ourselves of God’s mercy and offer our bodies as living sacrifices to him (Rom. 12:1–2). We cannot rise above the world’s difficulties until we turn our eyes to the one higher than ourselves. 2. Congregational singing affects our community. Second, congregational singing affects our community. What it does for us as individuals ripples outward toward those around us. The apostle Paul often encouraged the earliest churches toward authentic worship. He told these new Christians to encourage one another with psalms, hymns, and spiritual songs (Eph. 5:19). In other words, when we sing we’re reminding each other eternal truths and therefore forging a lasting spiritual bond between us. We’re not merely singing to God; we’re singing to one another. 3. Congregational singing helps our witness. Last, congregational singing is a radical witness to those looking on. Imagine what our singing together sounds like to an onlooking world that doesn’t believe. They see people singing together passionately. They see communities of desperate individuals joining together, men and women who couldn’t golf in the same country club or send their kids to the same school. And yet they’re joined together, singing to one another the unique melody of the good news. I was told as a child to “sing up” because it might be a good witness. But singing is always a witness to something—either to the greatest privilege of our lives or to the fact that, frankly, we’re bored. 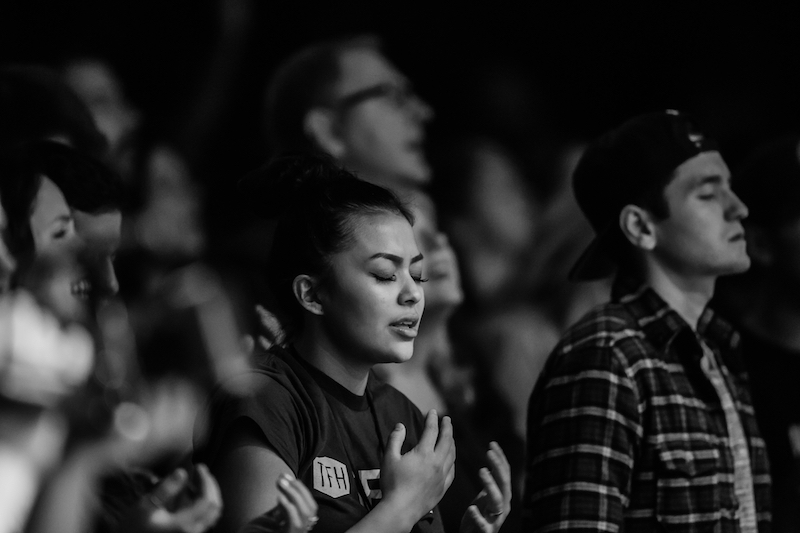 From those who visit our churches, to our children who’ve yet to believe, to people who hear our voices from the sidewalk—when we sing together of the grace of our Savior, it’s a powerful witness. I love Yo-Yo Ma. But singing with God’s people? Joining the eternal chorus? Embracing our blood-bought destiny? Standing with those who have tears in their eyes? Remembering when those same people stood next to me when I had tears in mine? Singing before this world of the only hope we have in the world? This is the eternal concerto of the soul—the ultimate masterpiece. Editors’ note: For more from Keith and Kristyn Getty, including information about their newest album Facing a Task Unfinished, please visit www.GettyMusic.com. Keith Getty will also be speaking on the tools of worship at the 2017 Bethlehem Conference for Pastors and Church Leaders later this month, January 30 to February 1. Register soon.